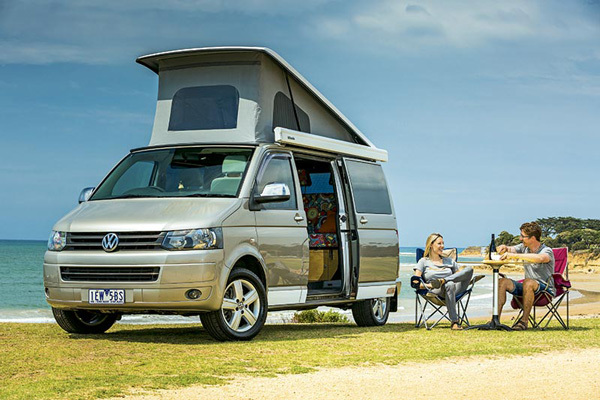 I must admit that, in the past, I was under the misconception that campervans were solely the domain of human relics from the ‘Age of Aquarius’ and/or bronzed Aussies on surfing safaris. 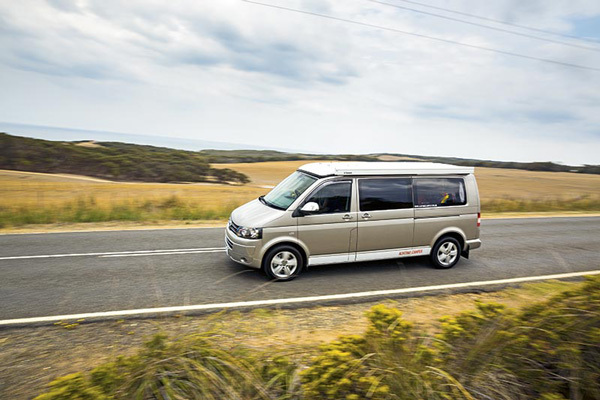 But we now live in a more modern age of enlightenment and, subsequently, a more genteel genre of travellers have embraced campervans as a peaceful way of traversing the continent. And if I still had any lingering false impressions, Achtung Camper’s Social Butterfly van conversion certainly put them to rest. Mind you, it looks like it wouldn’t be out of place in Byron Bay, or Snapper Rocks! 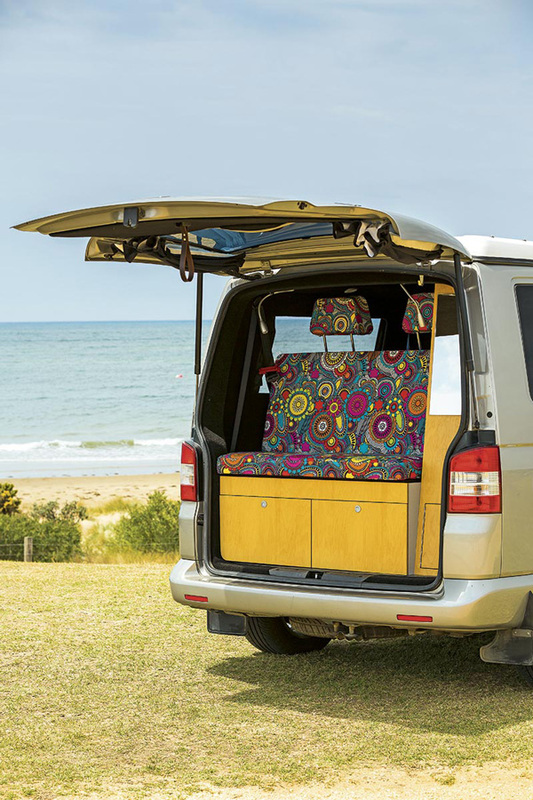 Based in Geelong, Vic, Achtung Camper is owned by Ronny Probandt and Tania Differding, who have spent years test-driving their campervans, continually upgrading features and refining their designs. 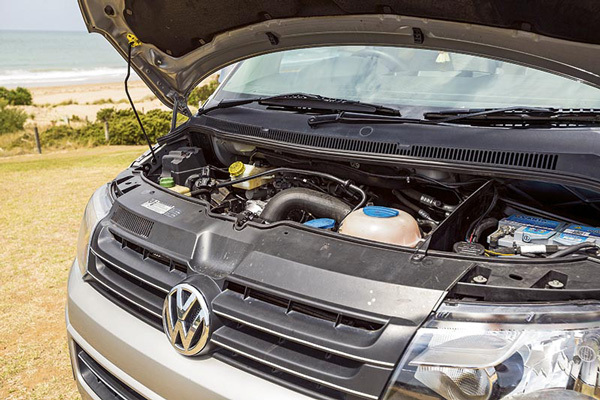 The Social Butterfly campervan I tested near Bells Beach – the historical and spiritual home of Australian surfing – is a tastefully decked-out 2010 VW Transporter LWB seven-speed, four-cylinder DSG auto with a 2L TDI400 engine. The Social Butterfly – like Achtung Camper compatriots Long Weekender and Nature Lover – has a retro-inspired fit-out complete with Maxiply premium furniture-grade film-faced ply, Quietspace recycled insulation designed to reduce noise transfer, and Autex environmentally-friendly carpet on the walls and ceiling, which adds another layer to reduce noise and gives a plush modern finish. 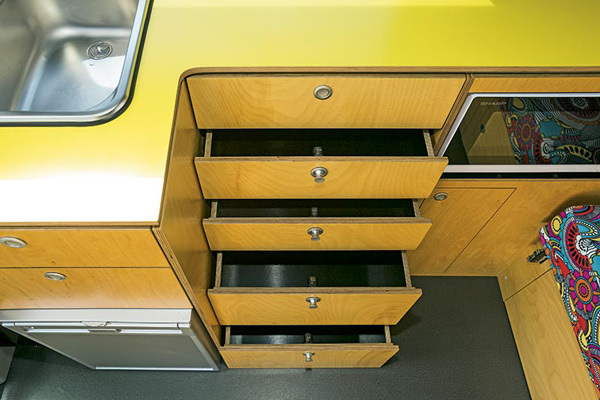 The cabinetry, with push-lock handles on all cupboards and drawers is made to measure and looked to be fitted with precision. The Social Butterfly also comes with quality German-made drawer runners, hinges, screws and fittings, and double flooring. 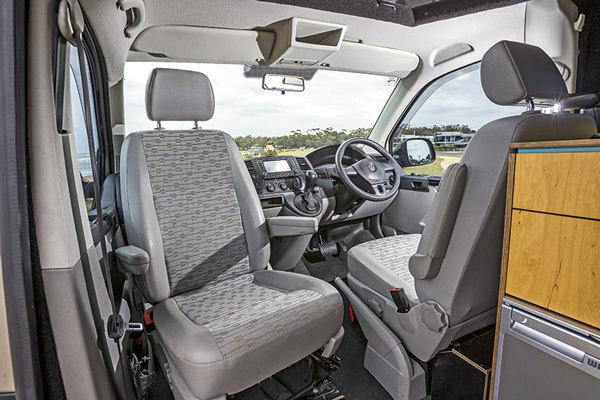 The made-to-measure wooden floor is topped with commercial-grade hardwearing vinyl, and this double layer helps maintain a comfortable temperature inside the campervan and also improves soundproofing. 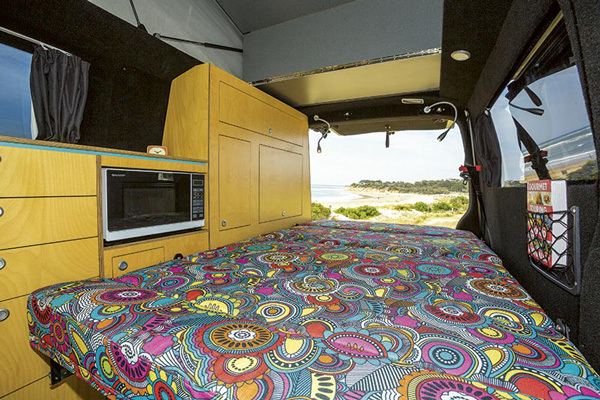 I was a little slow on the uptake with this campervan’s ‘psychedelic’, if not hypnotic, sofa, which converts to form the rock-and-roll double bed. Although, the kaleidoscopic Warwick upholstery fabric (Holiday Isle in Sunrise) did grow on me throughout the day. But my more youthful CW counterpart (staff photographer Nathan Jacobs) was entranced by it. In fact, Nathan was like a kid in a candy shop – totally captivated by the whole kit and caboodle of the Social Butterfly. If the psychedelic look isn’t your thing, you can choose your own colour scheme from an extensive range for the carpeted and insulated interior, sofa/double bed, custom-built cupboards and shelving, and block-out curtains. 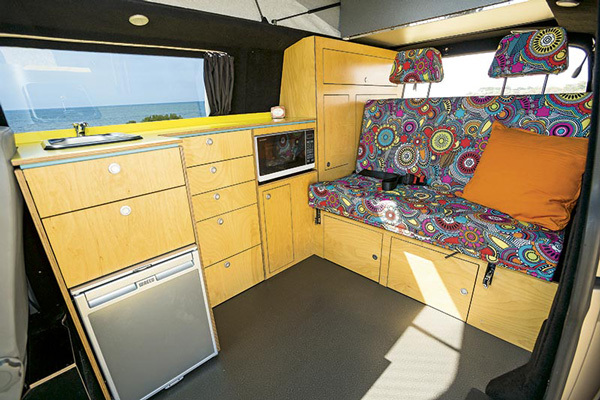 The Social Butterfly certainly gains acceptance and wins friends with its retro-inspired decor, particularly the yellow benchtop with timber cabinetry and light blue keyline, black carpeted interior and 100 per cent block-out curtains. 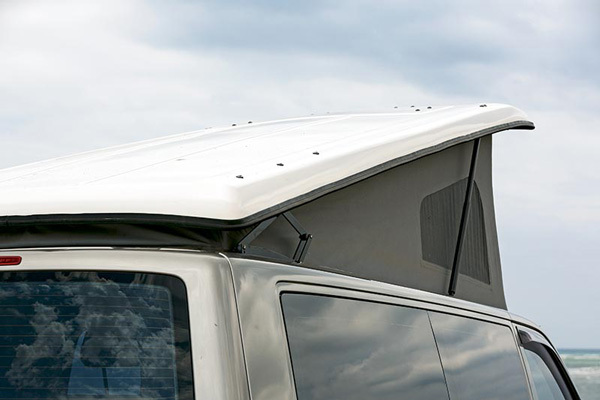 There’s also a handy leather strap inside to pull down the tailgate and a timber insert in the sliding door. 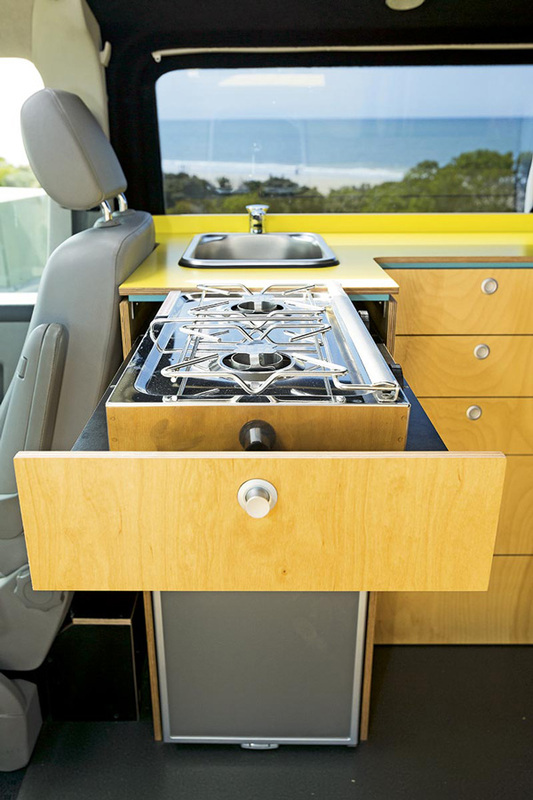 The Social Butterfly also carries a portable Origo two-burner alcohol-fuelled stove for indoor or outdoor cooking, Sharp compact microwave, 50L Waeco fridge-freezer, stainless steel Smev sink with hand pump, 42L drinking water tank, and a custom-made, easy pack-away table for inside or outside use. It’s basic in its facilities but is set up for flexible cooking and dining. There’s no denying the Social Butterfly would prove popular with those still living the alternative lifestyle of the 1960s and 70s New Age movement as well as the exuberant youth riding the crest of many a wave along our extensive coastline. But I reckon it will also appeal to a much wider demographic of traveller. 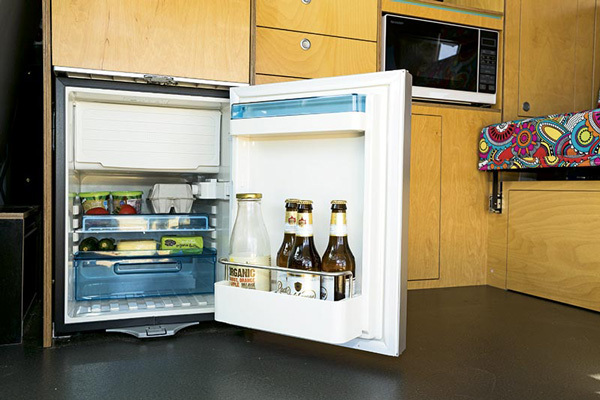 The Social Butterfly is perfect for those intending on primarily staying in caravan parks, or for shorter trips into national parks, but it’s not totally self-sufficient for those contemplating long-term stays off the grid. Regardless, you can get your own (travelling) party started with the Achtung Camper Social Butterfly!